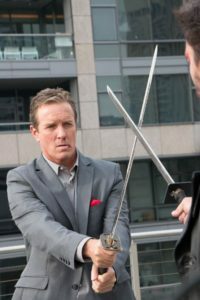 Linden Ashby is know for his roles on Teen Wolf, Melrose Place and The Young And The Restless. I talked to him about his new movie Beta Test, doing his own stunts, he teased the new season of Teen Wolf and talked surfing. You can listen below. BETA TEST, starring Arrow’s Manu Bennett and Larenz Tale (House of Lies), hits cinemas nationwide July 22. From producer/writer/director Nicholas Gyeney, and produced by Mirror Images LTD, comes BETA TEST a sci-fi action thriller that’s “a cross between the intimate suspense of Die Hard and the 21st century chaos of Gamer”. The film’s storyline revolves around Max Troy (Tate, House of Lies, Rush), a Seattle-based video game champion and game tester who is about to test the latest game sensation from global video game juggernaut, Sentinel. As Max begins his procedural dissection of the game, he begins to realize this new game is not like any other. As Max completes new tasks, events in the real world begin to mirror them. Soon, Max uncovers a deep-rooted conspiracy from within the walls of Sentinel, which leads him to discover that the game’s protagonist, Orson Creed (Bennett, Arrow, The Hobbit), is a real man, in the real world. If Max can somehow join forces with Creed, together they may have a chance at unraveling this conspiracy before the tasks in the game escalate and overwhelm their city.